Can the past be a reliable guide to the future? Many important decisions about planning for flooding rely on statistical assessments of risk. These assessments usually involve looking at historical data sets. With increasing evidence of changes and variability in climate, and other drivers of flood risk, there is now a growing concern that the past may no longer be a reliable guide to the future. Many types of change (or non-stationarity) can be included in statistical models, but these types of model have not been routinely applied in flood risk analysis. 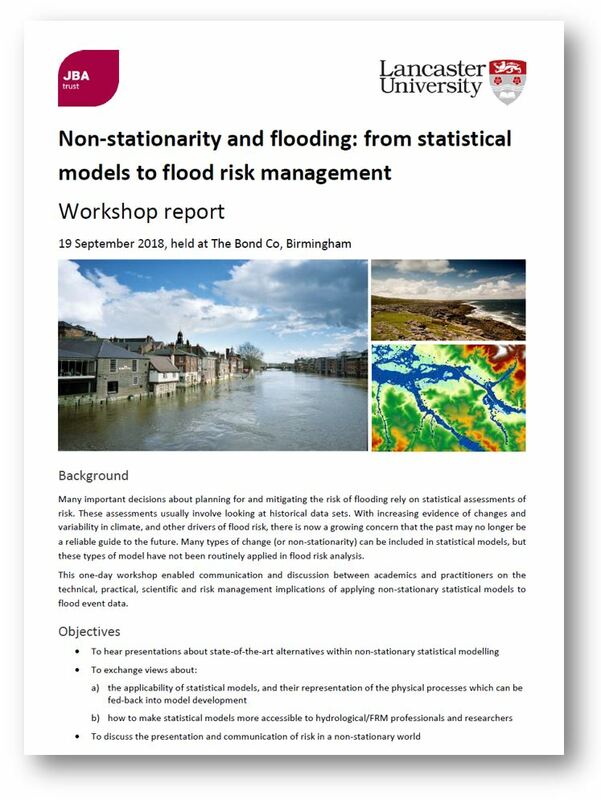 This one-day workshop enabled communication and discussion between academics and practitioners on the technical, practical, scientific and risk management implications of applying non-stationary statistical models to flood event data. The event was sponsored by HEIF Impact Acceleration Account funding from Lancaster University with support from JBA Trust, and convened by Dr Emma Eastoe of Lancaster University, with our support.